Our Magnolia Wedding Package is perfect for the couple who is looking for world-class photography, but doesn't need all the extras that come with traditional photography packages. Included in this package is unlimited photography within your coverage time, digital negatives, delivered on a CD and an online gallery to view and share. Unlimited pictures mean unlimited memories. Unlike other photographers, we never limit the number of photos included in your package. We know how to find the most candid and special moments in your wedding, and we take as many pictures as needed to fully tell the story of your special day. 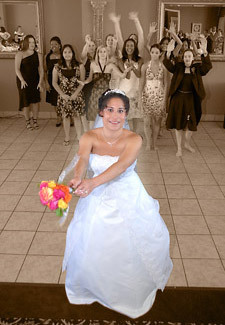 • 5 hours of professional photography on your wedding day with one photographer. • All photos viewable on your own online wedding gallery. • View and Order unlimited prints online. • All photos at full-resolution on CD-Rom – Your "digital negatives" with full reproduction rights. • A $100 credit towards bridal portrait photography. Your non-refundable retainer of $600 holds your wedding date. We accept payment in check, cash or money order.